Two great percussionists, Greg Fox and John Colpitts, come together as Fox Millions Duo in a work that expands the dimension of rhythm, revealing their ambitious scope. The New York experimental music scene has given rise to countless stellar musicians, and the current generation of artists continues this rich tradition. This culture has also established a yearning for collaboration, and one of the more interesting partnerships of 2019 comes courtesy of two of New York's most talented percussionists. Greg Fox has been almost everywhere, from bizarre experimental rock weirdos Zs and retro rock fiends PC Worship to jazz/metal fusion, avant act Ex Eye, and most recently industrial outcasts Uniform. On the other hand, John Colpitts (aka Kid Millions) is part of experimental psych rock, krautrock enthusiasts Oneida, and he has also collaborated with an impressive array of artists including Royal Trux, Spiritualized, and Laurie Anderson. The result of this collaboration is Biting Through, a record dedicated to rhythm as a whole. Works that focus on rhythm, need to radiate with a genuine feeling, something that is sometimes lost during the recording process. In order to avoid that effect, Fox Millions Duo decided to perform each track live and avoid using overdubs. But, for this endeavor to be successful, the duo undertook a meticulous process of discussing their ideas and through multiple takes deciding on the best feel and progression for each track. It is this first part of the process that delivered the stellar drumming of Biting Through. Even just on its own, the drumming in this album is simply stellar, arriving both with purpose and conviction, but also with a natural and fluid delivery. The title track nails that vision, as it kicks off in an imposing and powerful manner before it retreats to an improvised overture. But musicians like Fox Millions Duo do not remain content with an album that is based solely around the traditional drum kit. Instead, the two walk the extra mile to expand their instruments, and in order to do so, they traverse the synthesis dimension. The duo implements a very intriguing sonic augmentation in this manner, by running contact microphones through their modular system. This technique has the astounding result of producing an impressive collage of sounds, which adds more depth to Biting Through. While the percussion acts as the backbone of this work, providing it with a foundation and a core, the synthesis constructs the record's ambiance. In its more simplistic form, the synthesis can have a simple effect on the overall sound. The ending of "Clasp" is a prime example of that, as the distortion takes over and reconfigures the timbre of the drum kit. "Nine Years Facing a Wall" is another instance when a more pedestrian rhythmic pattern can be transformed into something much more potent and volatile. It can also produce impressionistic moments, as with "Wealth", where the free-flowing drumming is given that extra push necessary to arrive with a heavier groove and a healthy dose of swing. But then there are times when this amalgamation takes a giant leap forward. It is through this bizarre lens that Biting Through completely unravels its rhythmic component. Through this approach it is possible for the duo's varied performance to be perceived under a different light, in producing an otherworldly, verging on psychedelic explosion. This is most obvious in moments like "Clasp", where it feels as if an alien orchestra has taken over, with the duo bending the sound to the extent it begins to resemble the human voice. 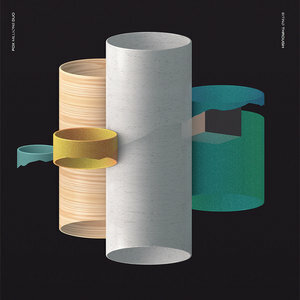 Through this collection of intricacies, Biting Through becomes a record that operates in layers, with Fox Millions Duo finding a unique way of concatenating all these different parts together, forming a strangely cohesive result. This is what essentially makes this work a clinic, not only in the concept of rhythm but also on how it can be expanded and morphed into a higher dimensional form.